The crosses at Good Shepherd show a very unique design which is extremely though-provoking. The Good Shepherd sanctuary motif was designed by Concordia College art teacher and Redeemer parish member, Don Williams and was constructed by David Oldfield. What do people see when they look at the spectacular crosses and lamb on the front of the sanctuary at Good Shepherd church in Toowoomba? The Lamb Perhaps the central focus of the design. The lamb is the sacrificial Lamb of God. A reminder of Jesus' command to "Feed my Sheep". The lamb reminds us that we are a child of God as sheep of the Good Shepherd. 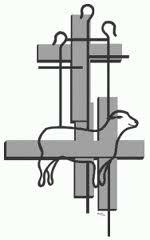 A lamb at the foot of the metal crosses reminds me that crooks just like me are at the feet of Jesus/God. The smile on the lamb is a smile of contentment at being safe in the arms of God. The single upright cross is central to our belief that Jesus died on the cross for the sins of the whole world. Three crosses signify that three people were crucified on Calvary. The empty crosses mean that Jesus overcame death for our Salvation. Two crosses lying down means that the Good Shepherd laid down His life for us sinners. The horizontal crosses remind us that they were carried through the streets on the back of the condemned before the crucifixion. Three shepherd crooks which are actually crosses remind us of the Trinity, with the last one facing forward as we look forward to the next coming of Jesus. Jesus is our "Good Shepherd" who cares for and protects His sheep and keeps us from harm. Three crooks and three crosses remind us of the "Trinity". Two crooks facing the same way could represent Jesus and the repentant thief on the cross. The Shepherd crooks were carried by the shepherd to help if sheep were straying off or had fallen onto a ledge and to get them back to the fold.